“Our track record for challenging homophobia in East London is quite well known.” he added. Oxfam seems to agree: they cancelled an event at the East London Mosque a few years ago after learning that a headline speaker, Ibrahim Hewitt, had declared gay people should be “severely punished” under Islamic law, which some might think sounds slightly Islamophobic. ‘Pride in London’ (may one no longer have pride in London without… O, never mind) has made it known that they will not tolerate this kind of thing: “If anyone taking part in our parade makes someone feel ostracised, discriminated against or humiliated, then they are undermining and breaking the very principles on which we exist. Our code of conduct is very clear on this matter,” a Pride spokesperson said. “All volunteers, staff and parade groups agree that Pride celebrates diversity and will not tolerate any discrimination of any kind. While our parade has always been a home to protest, which often means conflicting points of view, Pride must always be a movement of acceptance, diversity and unity. We will not tolerate Islamophobia,” s/he added, rather emphatically. Perhaps the Bishop of Liverpool might advise on this complex matter of mutually-exclusive freedoms. The Rt Rev’d Paul Bayes has just become a patron of his city’s Pride Festival, which he will doubtless use to highlight the sins of promiscuity and infidelity within the LGBT community while lauding the virtues of fidelity, monogamy and holiness in sexual behaviour, as the Church of England believes and teaches. It is wonderful that a bishop has been honoured with such a prominent pulpit at this sensitive time, in order that he might challenge prejudice and confront discrimination head-on. But if ‘Allah is Gay’ placards were to appear in Liverpool Pride, whose side would the Bishop take? That of the police who seek to censor them (uniquely) for their intrinsic Islamophobia and causing great offence to local Muslims? Or that of gay (ex-)Muslims who seek to highlight the homophobia in their religion, and the appalling suffering and persecution of LGBT Muslims across the Islamic world(s)? How might he advise the Liverpool Pride community advisory board if they were faced with the same theo-political decision as ‘Pride in London’? What are the limits of discrimination and diversity? Which expressions of diversity must be excluded in order to secure a ‘safe space’ or foster unity? If the Bishop believes in “tackling prejudice and promoting awareness of the richness of our LGBTI+ community”, why should the CEMB be denied the free expression of their colourful and important voice within that community? Or are we simply to accept the defamation of Jesus and the Church in the name of tolerance and acceptance, but prohibit the defamation of Allah or Mohammed because of a de facto (if not de jure) sharia blasphemy code being zealously implemented by the police? In the hierarchy of competing rights a battle is being waged for supremacy. With the Church neutered in the never-ending pursuit of a happy via media of mutual flourishing and good disagreement, the apparently irreconcilable polarities are occupied by certain advocates of Islam (mediated by the MCB) and certain advocates of LGBT equality (mediated by Pride). It is difficult to see a successful via media compromise emerging between the two: one either permits ‘Allah is Gay’ placards, or one censors them. Perhaps it’s time for the emergence of a Queer Prophetology, something akin to the debates surrounding the Queer Christology of embodied friendship and the divine celebration of incarnational diversity, for, as the eternal archetypal Muslim, surely Mohammed was the embodiment of all human variation and behavioural modulation? 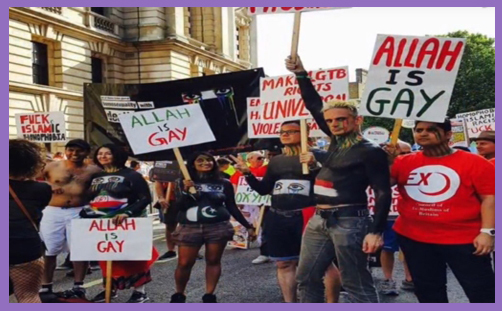 Or is ‘Pride in London’ about to make the theological determination that Allah is not, never has been and never will be gay, and that to declare so is undoubtedly offensive (ie blasphemous) to orthodox Muslims? No doubt, then, the CEMB will be barred from future Pride marches “on ‘Health & Safety’ grounds”. And no doubt the Bishop of Liverpool will remain silent. *For the sake of clarity, ‘Porkies’ is vernacular English rhyming slang: ‘porky pies’ rhymes with ‘lies’. It is not used here with the intention of causing gratuitous offence to any Muslims, such as, for example, might the hanging rashers of bacon over the door handles of a mosque. **This blog post may not be interpreted as any kind of incitement to create and display such a placard, for your own safety’s sake (and the sake of the Archbishop Cranmer blog).